Louisa jones is from Northumberland, now based in London. She studied Dhrupad, a form of northern indian classical music with sarangi player Nicolas Magriel, vocalist Uday Bhawalkar and the Gundecha Brothers in Bhopal. On a trip to the isle of Sherkin off the west coast of Ireland she was introduced to the accordion by musician and painter John Sim. In London she was taught traditional jazz on double bass by Dakota Jim. 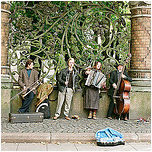 Louisa Jones writes the songs of Whiskey Moon Face and plays accordion and double bass. Ewan Bleach helps arrange things and plays clarinet and saxophone. Dakota Jim plays double bass and accordion and sings some if his songs. Special guests include Chris Barber's cornet player Magic Mike Henry, Russian trombonist Anton Wunderlich, Canadian song writer and banjo player Sam Bailey, French violinist Mirabelle Gillis, Scottish drummer John Blease, Cornish trombonist Skye Murphy, Scottish composer and fiddle player Alastair Caplin. Ewan leads the Cable Street Rag Band in their large repertoire of rare old songs ranging from the rough raggy blues songs of the 20s to the rich luscious ballads of the early 40s. 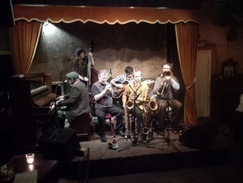 The Man Overboard Quintet add their own stamp to a repertoire of tunes made famous by the likes of Billie Holiday, Django Reinhardt, the Mills Brothers, Duke Ellington and Fats Waller. The chemistry between these superb musicians and their audience makes every performance by the Man Overboard Quintet a magical occasion. The Man Overboard Quintet were featured in BBC3’s “Being Human” (5th series, 6th episode), and have appeared several times on BBC Radio 3’s In Tune. The Man Overboard Quintet recorded their first album in September 2012 at Champs Hill studios. The album was released in July 2013. 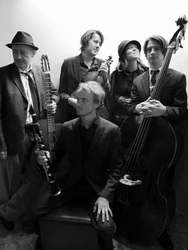 Leading this stunning band are violinist, Thomas Gould and star of London swing, clarinettist Ewan Bleach. This great partnership is complemented by the unique voice of Louisa Jones and a hot rhythm section with Jean-Marie Fagon on guitar and Dave O’Brien 0n the double bass. Using garage band recording layers of stuff with different instruments... cornet, double bass, clarinet, accordion, piano, irish whistle and voice.